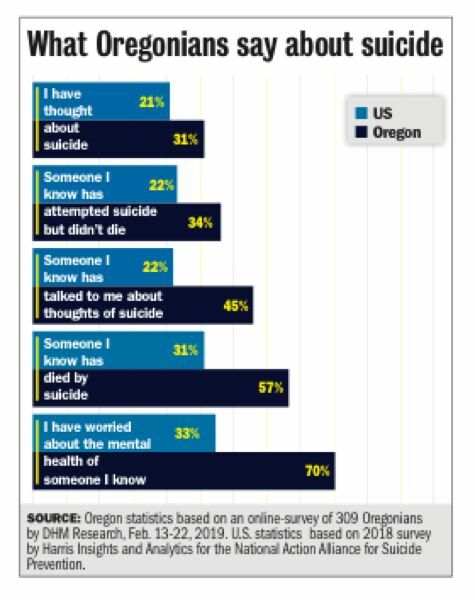 Oregonians are more likely to consider suicide than the average American — with nearly one-third across the state reporting that they've considered taking their own lives, according to a new poll. A DHM Research survey found that 31 percent of Oregonians report having had suicidal thoughts, compared to 21 percent of all Americans. The grim results align with Oregon's higher-than-average suicide rate. Last year, about 18 per 100,000 Oregonians killed themselves. Nationwide, it was 13 per 100,000 people. "It's a more common experience in Oregon. They are more likely to know somebody, more likely to talk to somebody," said John Horvick, a vice president for the polling firm. "That ripples out into their relationships with other people." But the concerning rate of self-harm doesn't mean cries for help go unanswered. In fact, 67 percent of Oregonians said nothing could stop them from trying to prevent a self-inflicted death, compared to 39 percent nationally. Many other respondents nationwide said they might hesitate for fear of doing or saying the wrong thing, or out of fear that nothing they did would make a difference. Counselors at Lines For Life — which operates a 24-7 crisis center in Southwest Portland as part of the National Suicide Prevention Hotline (800-273-8255) — have been found to de-escalate more than 95 percent of all incoming calls without needing to contact first responders. Lines For Life chief executive Dwight Holton says it's crucial that Oregonians keep talking, as honest talk can shatter the barriers that prevent people from seeking help. "Human connection is what matters," he said. "It's OK to not feel great, but what we know is: reach out for help, because help works." Oregon's high rate of suicides may be helping to break down the stigma as well. Fifty-four percent of the survey respondents say they've talked openly about suicide, in contrast to 42 percent nationwide. — 70 percent of Oregonians have spent time worrying about a friend or family member's mental state. The national average is 33 percent. — About 34 percent of Oregonians know someone who has survived a suicide attempt, as opposed to 22 percent nationally. — Only 9 percent of state residents report no familiarity with suicidal thoughts or actions in their lives, compared to 28 percent of all Americans. In follow-up interviews with the Pamplin Media Group, several poll respondents said they were not surprised to learn Oregonians are comfortable talking about suicide. "I don't consider it to be a dark topic," said one participant, a Beaverton resident named Danny. "Someone who (attempts) suicide is someone who has been pushed to their limit," he continued. "They couldn't think of any other way, and if they didn't seek out others to help them, then that's the course they chose." Another respondent, who spoke on the condition of anonymity, highlighted the burden for those battling mental health issues in the LGBTQ community, especially for those in their teenage years. "It's pretty lonely," said the Portland resident, who described feeling ostracized by friends after coming out as transgender. "There's this vast difference in outcomes, depending on whether a transgender person has a team of emotional support." Holton said his organization receives many calls from people who have been "other-ized" due to their sexual or gender identity, with calls flowing particularly to the YouthLine (877-969-8491). That said, Holton notes that the people most likely to kill themselves are older white men. "This challenge knows no racial, gender or other traditional boundaries. Suicide comes home to everybody," he said. "The most important thing we can do is make sure people know it's OK to reach out for help." The DHM online poll surveyed 309 Oregonians between Feb. 13 and Feb. 22. The margin of error is 5.6 percent. 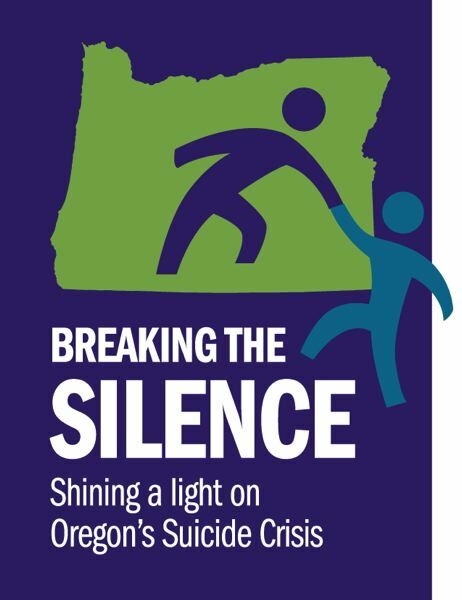 DHM conducted the survey, at no cost, for media organizations participating in "Breaking the Silence," a collaborative initiative to draw awareness to the issue of suicide in Oregon.